Finding the right agent is an integral part of buying or selling real estate. At The Gibbons Group, our priority is to provide an unmatched quality of personalized service to each client. If you’re looking for the very best team to have at your side during the home buying or selling process, you’ve come to the right place. 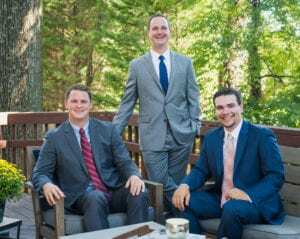 The Gibbons Group is a locally owned and operated firm that specializes in single-family homes, luxury properties, condominiums, and home rentals in DC, Maryland, and Virginia. We are a team who takes pride in our ability to provide an unparalleled level of personalized service to each client. Unlike other agencies that treat every client and every transaction the same, we know that every situation calls for a different approach and strategy. By working as a true team and not as individuals who share the same brand, we are able to give each client the full attention they deserve, so that every part of the process is executed and communicated as seamlessly as possible. Each member of our team knows that the home buying process can sometimes feel complicated, stressful, and overwhelming for clients. This is where we come in – our job is to make the process as smooth and stress-free as possible, so clients can get to their real estate goals with ease. At The Gibbons Group, we use a proven six-step home buying system designed to help you find an ideal home that matches your needs and preferences. During the meeting, we’ll give you an in-depth look at the steps involved, the costs, and everything else you need to know about the home buying process. In as little as two days, we can get you qualified and out looking for a home that fits your lifestyle and budget. As soon as you find that special property, we’ll guide you through the contract, the negotiation, and the close. This is the home buying process broken up into six easy steps – and you can rest assured that we will be guiding you through every single step to get you the keys to your new home in no time. The Gibbons Group is a team that will always put you first. The key to our success is our commitment to build long-lasting relationships with clients based on integrity and trust. Our passion for what we do extends beyond just a simple real estate transaction – we look forward to helping you discover the very best of what Chevy Chase, Bethesda, and other communities in Montgomery County and the Washington, D.C. have to offer!